As I write this, it’s an pleasantly unseasonable 65 degrees here in Philly. 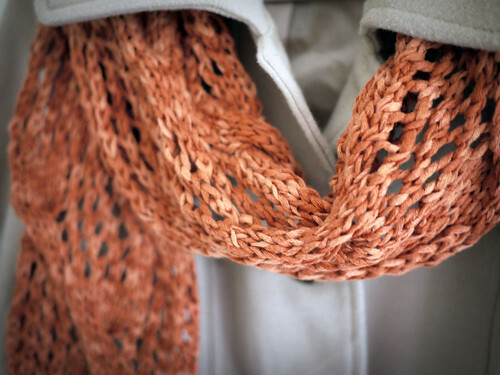 Perhaps not the most appropriate day for a scarf post, seeing as how it feels more like April than December! No matter, I’m sure we’ll be in for a chilly blast sometime soon. This is my last ‘travel’ project for the time being, started and finished on flights around the country. Making goodies for the baby is a lot of fun, but I wanted to be sure to make one nice, frivolous thing for myself before I have a whole lot less free time. 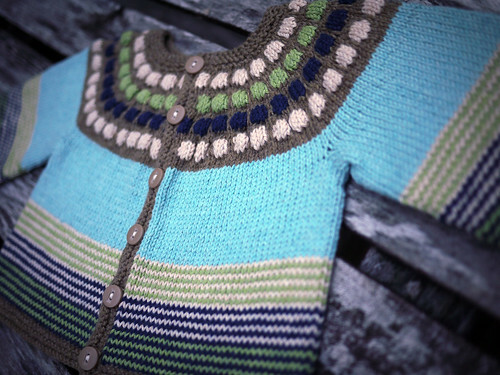 Looks great with my maternity coat, which is getting a tad snug as I head down the final stretch. I can’t believe there’s only a month left until my due date! I’ve been busy getting the nursery ready, but still catching a chance to knit from time to time. 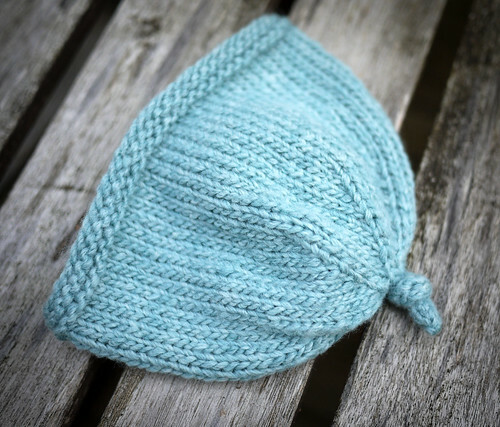 Here is a teeny tiny little newborn hat. Hopefully it will be the first thing he wears! We recently found out that our upcoming addition is a boy, and we’re absolutely over the moon. 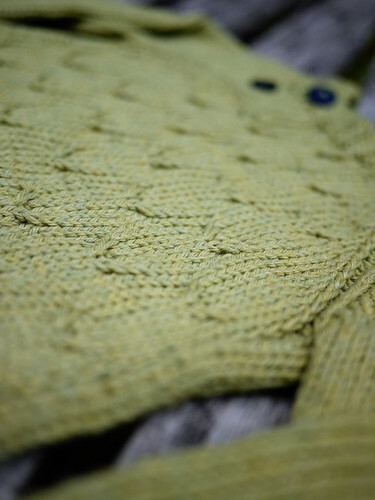 I’m taking the opportunity to delve fully into less gender neutral knitting territory. 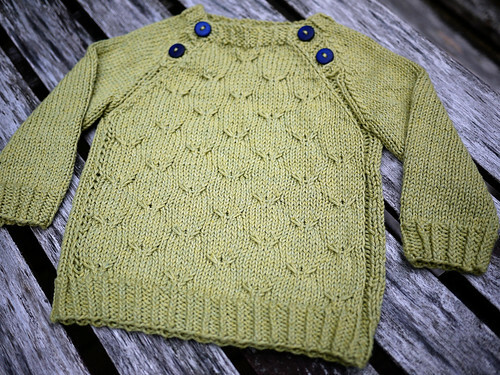 While on vacation last week, I finished this sweater. Buttons: JoAnn Fabrics I liked the pattern, though it was a little tricky… especially around the underarm joins. 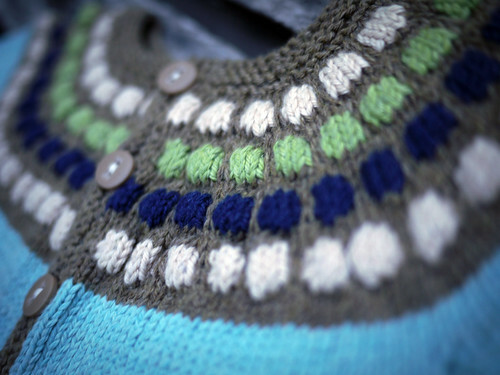 The only change I made was to use Elizabeth Zimmerman’s sewn outline stitch bind off on around the neck. 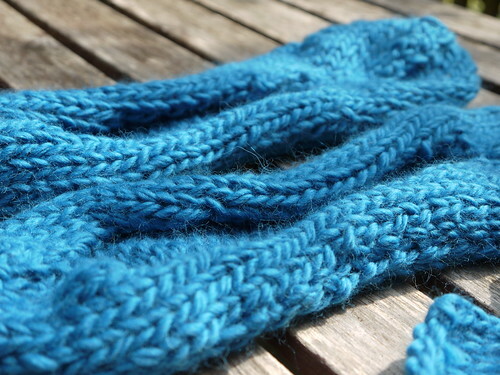 It matches the long tail cast on method much better than the purl bind off called for in the pattern. … and not of the Lawrence Welk variety. The big news around these parts is that we’re having a baby! Very exciting. The short version: it’s our first, due next year, and we don’t know boy/girl yet, but we will be finding out in three weeks or so. Until then, I’m working on a few gender non-specific things to keep my hands busy. 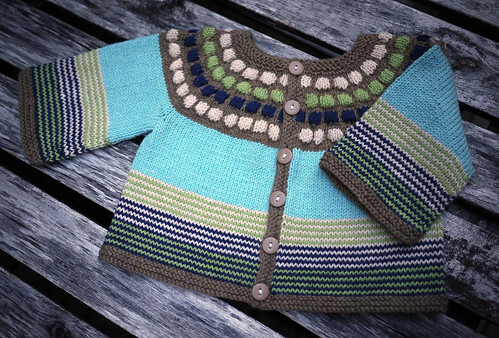 I’m not too hung up on the ‘blue is for boys’ thing, so to me this is a nice, neutral sweater. 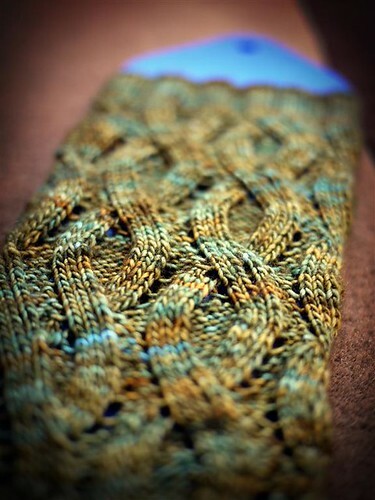 Besides having to weave in a lot of ends, it’s a great pattern that looks a lot more complicated than it actually is. 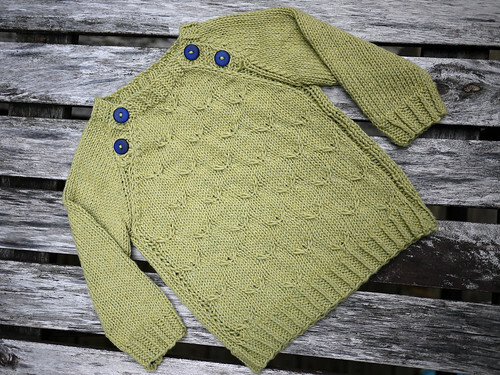 The kit came with patterns and enough yarn for a matching hat and booties, but I’m not really in love with either as written. 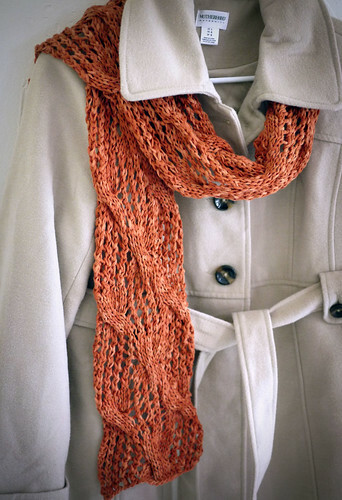 I’ll definitely make some matching items with the leftover yarn, but I’ll use other patterns. 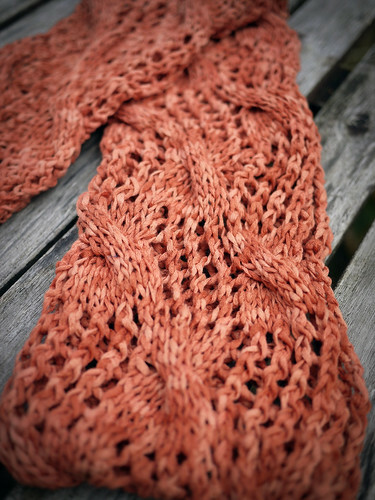 Ravelry to the rescue! 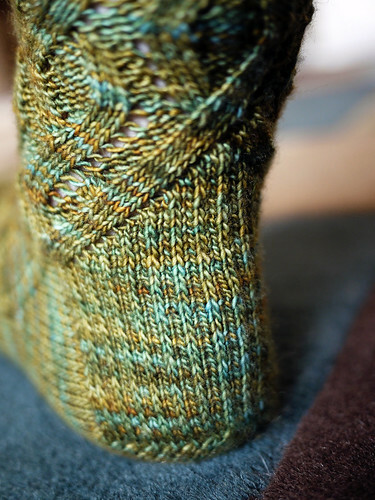 On a business trip to Texas last week, I finally put the last stitch in my lovely In and Out Socks. 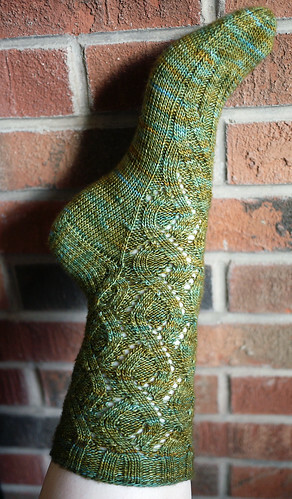 There are 19 gorgeous sock patterns (including this one) in Cookie A’s book Knit. 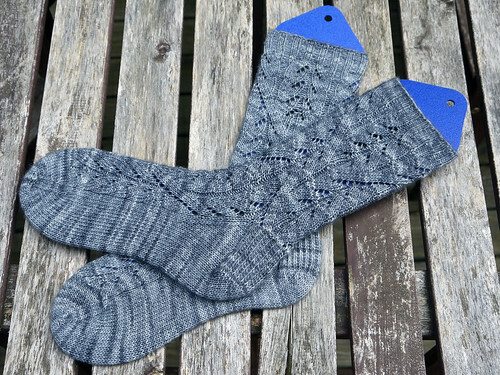 Sock. Love. And best of all, you can buy it in a .pdf edition for instant gratification. 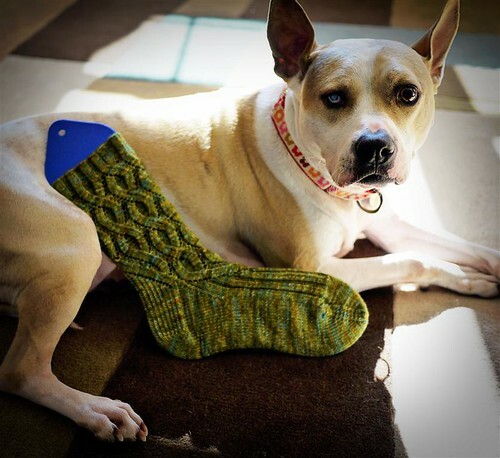 While knitting these socks, it became clear that the designer knows her stuff. Every detail seems to be meticulously thought out, from the staggered ribbing that transitions effortlessly into the cable patterns on the leg, to the heel that forms organically from the crux of a cable twist — no opportunity was missed to turn hum-drum construction details into eye catching design elements. 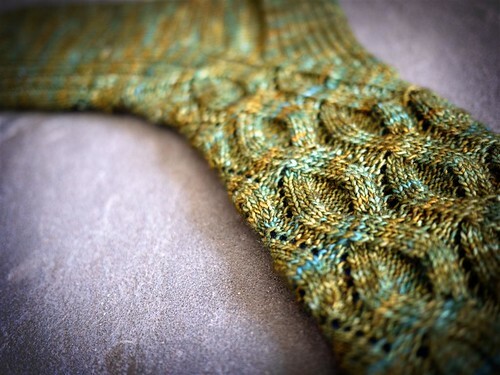 I finished my first In and Out sock on my west coast trip this week. The charts were just the right level of complicated to keep my interest on a long plane flight. 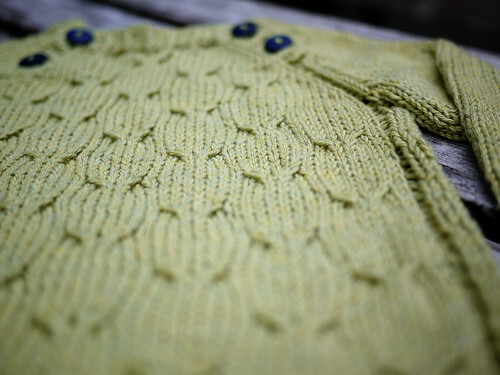 And finally, proof that this blog lives up to its name… a quick Blackberry snapshot of my knitting setup. Pre-takeoff, of course! And with a requisite copy of ‘SkyMall,’ no less. What can I say, it’s a glamorous life in coach. I’ve still had time to work on a little something for myself while jetting around the country for work. 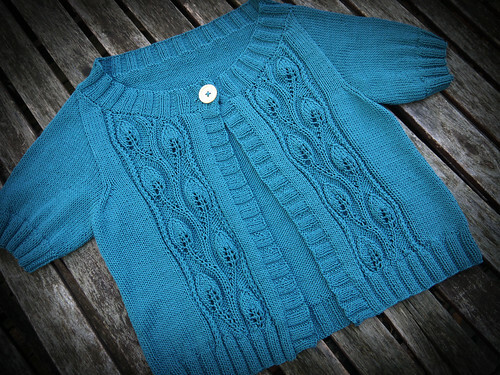 Just in time for a chilly Pennsylvania winter, I finished a short sleeved cotton cardigan. But who cares! Surely I’ll find an indoor event to wear this beauty to. 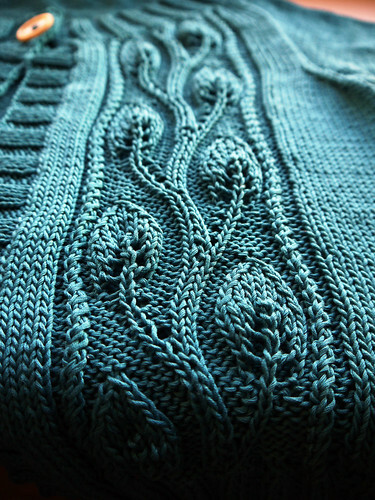 There are so many great knits in this book that I had a hard time picking just one to start, but this leafy cable stood out. And because no apparel post is complete without an awkward modeled shot… Oy. On the plus side, I’m very pleased with the fit. Hopefully I’ll be bringing you lots of gifty goodies once Christmas rolls around. Until then, happy holiday crafting! I’m on a huge sock kick right now. 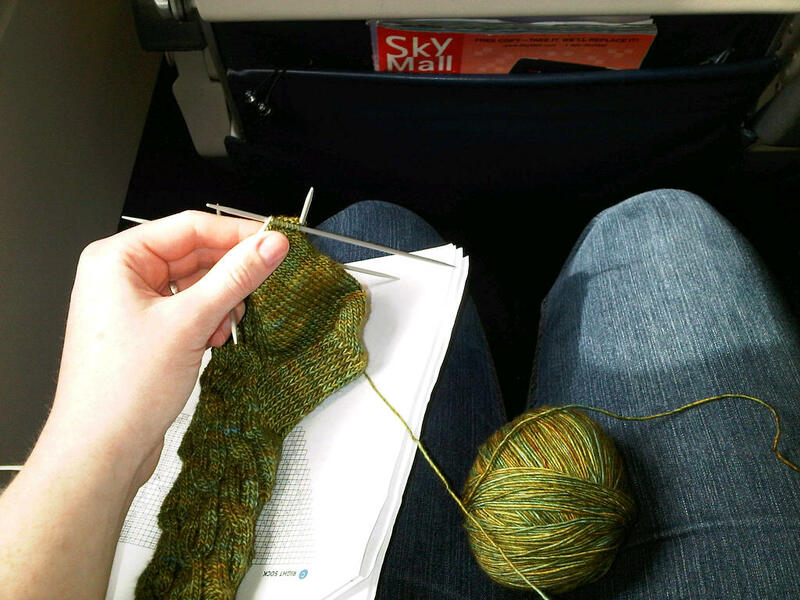 Socks are the perfect knitting project for plane travel — they don’t take up too much room in my laptop bag and they’re small enough that I’m not elbow-checking my neighbor every three seconds. 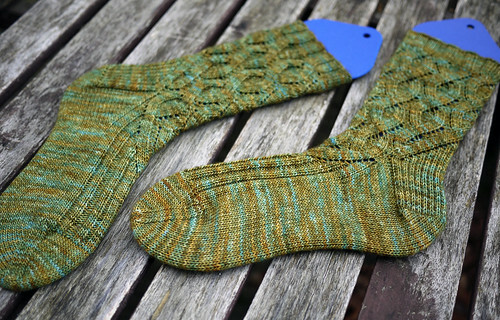 Here’s my most recent finished pair, which I got a ton of work done on courtesy of a five hour delay from DTW to PHL. Sheesh. Did I mention I’m on a huge sock kick? Look what showed up at my front door this afternoon: enough sock yarn to keep me busy on my upcoming vacation. Just me, hubby, family, lots of knitting and absolutely NO tv or internet. Sounds like heaven! 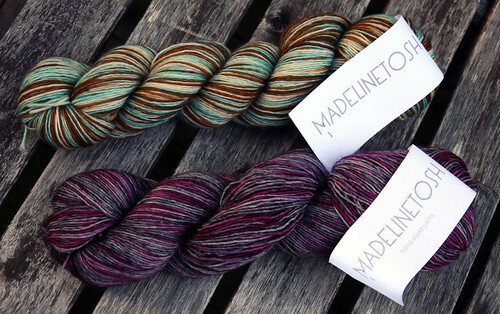 I’m seriously addicted to Madeline Tosh’s Light Merino, which I used most recently in my Portland Socks. 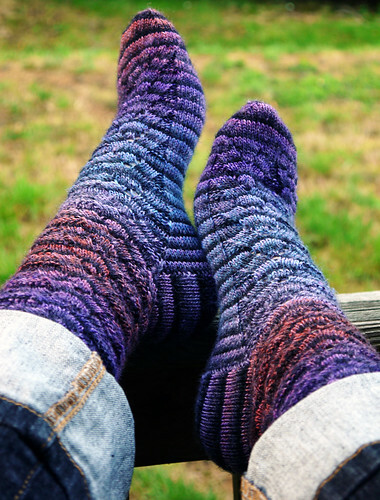 I loved it so much that I had to indulge in a few more colorways. 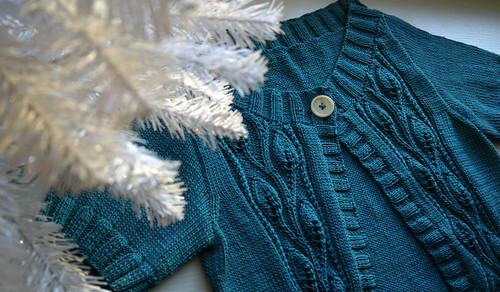 It knits up beautifully and feels heavenly. A little pricey, but worth the splurge! 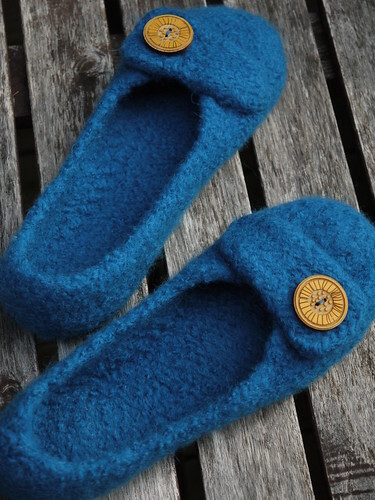 A present for my perpetually cold feet: French Press Felted Slippers, in Debbie Stoller’s Full ‘O Sheep. These bad boys were HUGE before I felted them! One hot trip through the washer, several fittings, and basic assembly later, and my new slippers were done. 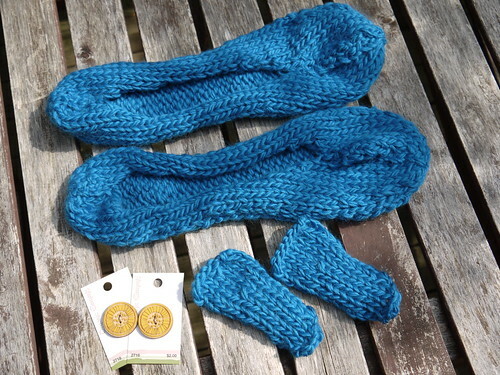 Proof that yes, indeed, I do actually knit! 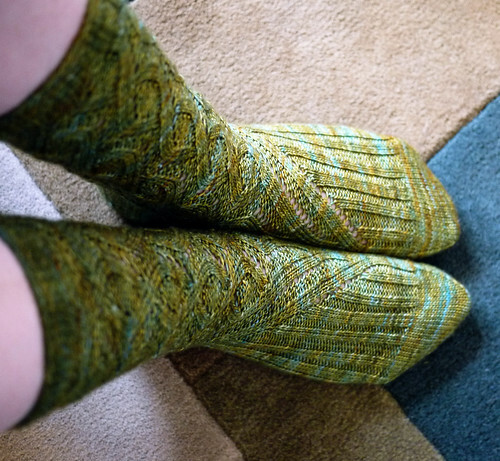 I bought the yarn for these socks on the last day of my annual trip to Portland, OR, to visit friends on the west coast. The mottled grey color perfectly captures the city’s perpetually and pleasantly rainy skies. 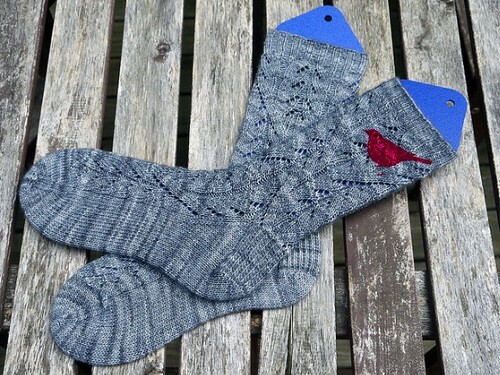 Although… to truly be Portland socks, I would need to put a bird on them. Spruce them up. Make them pretty.